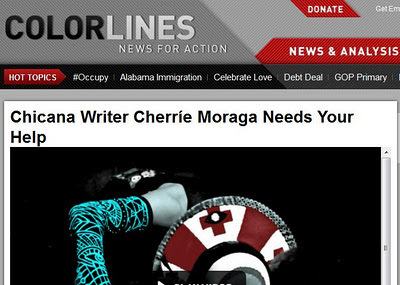 "Cherrie Moraga Needs Your Help"
"It’s been 30 years since queer Chicana poet Cherríe Moraga co-authored “This Bridge Called My Back” with Gloria Anzaldúa. The book is still praised as an influential anthology of radical writings by women of color, and has become standard in many gender and ethnic studies classrooms across the country. Moraga has remained a prolific writer over the past three decades, and now she’s reaching out to her community for help with her latest work. Her new play is called “New Fire: To Put Things Right Again” and, if it gets the financial support that it needs, will premiere in time for Brava Theater’s 25th anniversary next year in San Francisco. The play is currently in pre-production. Moraga and her partner, producer Celia Herrera Rodríguez, have begun a Kickstarter campaign to raise funds and start rehearsals next month. In short, it’s the story of a 52-year-old woman who battles against apocalyptic notions of 2012 to return to her indigenous heritage. The project has already got an impressive cast that includes comedian Adelina Anthony. With less than five days left to in the fundraiser, the campaign is still $6,000 short of its $26,500 goal. Go here to make a donation and help the play become a reality."